Do you want to know how to plan, take and process high quality images to create accurate and detailed 3D models? This three-day course covers photogrammetric techniques from both a theoretical and practical aspect. Led by a highly experienced tutor, in a small group setting, it provides teaching in the use of cameras and a hands-on processing experience. A high level of tutor/student interaction is possible as this course is never run with more than 6 delegates. Those who are interested in how to maximise data collected from a small unmanned aircraft (SUA) should consider the two-day SUA Photogrammetry Course. This course contains no practical sessions but is packed with tips, advice and demonstrations on how to best exploit the imagery collected from the air. Photogrammetry has undergone something of a renaissance in recent years resulting in TSA’s decision to run a quarterly short course on the topic. The demand for the course has arisen because of the recent introduction of more user friendly and semi-automated methods developed via a combination of computer vision algorithms and conventional photogrammetry. the use of small unmanned aircraft (SUAs) for survey and reconnaissance work. The new technique uses image matching methods and off-the-shelf cameras for the production of geo-referenced point clouds that can be favourably compared to those produced by laser scanners. The use of SUAs for aerial survey of smaller sites is a fraction of the cost of conventional aircraft and the newer algorithms are perfect for the analysis of the many smaller and more randomly distributed images taken on an SUA project. An example of a mid-range SUA carrying a video and a still camera. 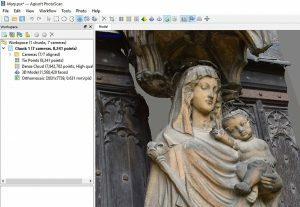 Agisoft Photoscan photogrammetry software in use for the production of an architectural 3D model. The course extends over three days and includes six sessions of 2.5 hours each. The same software showing a topographic 3D model and the distribution of the aerial images.